Anandita Vyakarnam focuses her practice on patent litigation, opinion work and client counseling in the pharmaceutical and health care fields. Ms. Vyakarnam has particular expertise in Hatch-Waxman litigation, having represented both branded and generic drug companies. She has also litigated patents in the chemical, biotechnology, medical device, cosmetics and consumer products areas. 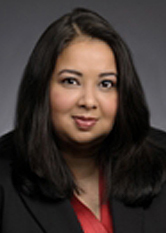 Her experience includes a variety of other patent-related matters, including licensing, contracts, intellectual property due diligence in mergers and acquisitions, client counseling concerning strategic ANDA filings and opinion work regarding patent validity, infringement and freedom to operate. Ms. Vyakarnam has a Ph.D. in biochemistry and conducted post-doctoral research in cancer genetics at Columbia Presbyterian Medical Center in New York, prior to earning her J.D. at Columbia University School of Law.